not sure whether this has been mentioned already, but in my gaming group we would LOVE to have a new feature: a button that can be clicked to show the front, side and rear arcs of a selected unit or model. in many game systems, if you want one of your units to perform an action against a target (e.g. declare a charge, cast a spell, fire shooting weapons), you must check whether the target is in the "line of sight" of your unit. in the example below: the 16 crossbowmen need to be able to trace a line of sight to an enemy unit (the chariot or the 5 knights) if they want to charge it. can the crossbowmen charge the chariot? can they charge the knights? selecting tools > meters > sight arc, then rotating it and positioning it next to the corner of the crossbowmen unit, then moving it a bit more into position, rotating it again, checking with your opponent whether the positioning is fine, finding that you can't really see whether the chariot is in range because it's too far away and the sight arc is only 12" long, selecting tools > meters > 30" stick, rotating it and positioning it next to the border of the sight arc to extend its reach, and then checking whether the target is in sight. select the crossbowmen unit, and toggle the "line of sight" button next to the x-y movement button. in this way it's very easy to see that the crossbowmen can charge the knights but not the chariot. i can't emphasise how useful this is in each and every phase of most game systems turns'. imagine using it to unambiguously position your units outside of an enemy's unit line of sight. of course this can also be applied to verify whether a charge should be declared on the front, side or rear of an enemy. and, if implemented on a model-by-model basis, it could make shooting phases so much easier. so my question for Lorenzo il Magnifico is: can this "unit line of sight toggle button" be implemented? with a couple of features like this, i would feel ready to organise a UB2 tournament for the Quick Starter system of The Ninth Age. I like your idea, I will implement this as soon as possible. thanks Lorenzo, this is great to hear. could you also trace "inch lines" within the line of sight? something like in american football, but centered on the unit/model, rather than drawn on the field itself. this would speed up the game *enormously*: are your crossbowmen in charge range of my knights? are my knights in shooting range of your crossbowmen? do you have to apply a penalty for long range shooting? is this unit close enough to the army general to use his Morale value? you already provided us with great tools to make these verifications easy enough (e.g. the extendable meter), but with this new option your game platform would really "bust through the ceiling". we can also discuss the implementation details if you like. for example, you could use the same button as the unit/model "line of sight toggle": by default nothing is shown, click once and you get lines of sight, click again and you get inch lines too, click again and both sightlines and inchlines go away. also, you could have lines for each inch step, but then a thicker line (or a line in a different colour) at 4", 8", 12" and so on. if there's anything i can contribute (in terms of brainstorming, or in collecting declarations of interest from UB players), please just let me know. The way you drew the inch line I am not sure if it will be accurate once you take into consideration the wheeling. Also are the back lines necessary? thanks a lot for this, Lorenzo. i don't just mean for your work - i mean for letting the community interact with the developer in such an effective way. amazing. - yes, the back lines would be useful to determine whether you can charge an enemy on the flank or rear. this is admittedly rarer than the need for the front lines, so you can incorporate it by default if it looks cool, or add a different button (or use a cycle-button) if you feel like giving extra depth, or let it go altogether. - inch lines should be accurate when wheeling, yes. is there any simple way for you to draw "circles" around a model's base or unit's rectangle? i mean drawing all the points at X" distance from the perimeter of the base. in the following pictures this means light-blue lines parallel to the dark-blue lines in the base perimeter, plus light-red arcs generated by the dark-red base corner points. the colourful thick lines are 2" away; then you have simple chalk-white lines at 4" and at 6". this should work for both nonrotated models (left) and rotated models (right). if i were allowed to wishlist, i'd ask for a "coarse" button that makes red inch lines appear at 6", 12", 18", 24", 30", 36", 48" and 60", plus another "finegrained" button that makes white thin lines appear from 1" to 23" (excluding of course 6, 12 and 18). again, maybe a cycle button: none -> coarse -> coarse+finegrained. combine these inchline tools with the sightline tool and, in my experience, you will remove 75% of all players' discussion time. select, click, click, "my cavalry unit has a 13" rear charge on your dragon, do you agree? ", "yes", throw dices, "yay / crap". No problem, and thank you for the help visualizing it! Regarding the dynamically created circles, it's actually a very complex thing to do. Can you imagine a different way of doing this with a prebaked image? I am also not sure I understand the thing about the coarse and fine grained. And the reason to exclude 6 12 and 18. In general I am not sure I understand the request and when would you ever want to use thing. Nice changes . I'm like a child opening presents when you do an update. There is a problem with new update cause people watching the game can do thinghs like they were playing. Only the 2 players should be able to do things. Agree with the back and sides line of sight . Martins just noticed the issue with spectators, releasing a fix now. Also you can now delete models like UB1. Can you do something to delete with the delete key directly? so, back on topic, thanks for the feedback, Lorenzo. 1) "In general I am not sure I understand the request and when would you ever want to use thing." - i will suppose we agree on the usefulness of inchlines, since this drastically reduces the "UB-slow-down" factor. instead of selecting instruments, meters, the right meter, no snap i got the wrong one, delete it, select a new one, position one end on one unit, position the other end on the target unit, hear your opponent grumble in skype because the meter isn't positioned exactly the way he would have positioned it, make an adjustment, ask whether he's fine with the new setup, wait for an answer while thinking "what a passive-aggressive do*cheb*g", get his ok, then verify the distance, no actually let's zoom in to make sure... you just click on your unit, activate the inchlines, and have your answer. even if you reduce the time from 10 seconds to 1 second, this is the kind of action that's performed hundreds of times in a game, so this time really adds up, and reduces the pleasure of the UB experience. all the guys in my gaming group would back me up here (i only say this because i never understood if you, Lorenzo, are actually a player!). 2) "Regarding the dynamically created circles, it's actually a very complex thing to do. Can you imagine a different way of doing this with a prebaked image?" yeah. this one is a tough one. i understand creating the circles dinamically can be quite a nuisance. if i understand correctly what you mean by "prebaked image" (mind you, i've studied literature and philology, so i'm relatively computer-naif) (by the way, i studied in Naples, and by looking at your name... are you from that area? ), i was saying, if i understand correctly, the only alternative i'd see is to create a "fan" for each unit frontage. one for a 20mm frontage (the smallest base i can think of), one for a 25mm, one for a 40mm, one for a 50mm, one for a 60mm, one for a 150mm, and so on. then when you have the "fan" button activated, once you select an unit you get its frontage value (say 100mm, since it's a unit with ranks of 5 small-infantry models of 20mm each), and you load the prebaked image for that frontage value, and you align it with the line of the front rank of the unit. i know it'd be quite annoying to make fans for each of these possible frontages, but what can i say, i'm ready to help. i could make a selection of a dozen sizes that would be most useful, and you could start working on them first. or you can try and explain me how i could create them using a (simple) software that would work for you. i am already very grateful that you're taking the time to read all this - the least i can do is to volounteer to do some of the work! this is all for the moment. i hope it's clear enough, since i'll be travelling for a week or so, and i'm not sure i'll be able to use the forum. anyway, thanks as always! I am still trying to wrap my head around this. The thing that I don't understand is that you drew a semicircle, although I don't feel this is appropriate. A semicircle would make sense only if wheeling was not counted and you could move a unit in any direction, the reality instead is that you can only move a unit straight, and if you want to move it somewhere else other than straight you have to wheel before which eats some movement based on the unit width. I feel the image you drew would not appropriately represent reality, unless I am missing something. so glad to read you haven't thrown this idea in the dustbin! i was starting to worry. i'm very happy to provide clarifications - just ask, whenever applicable. "if you want to move it somewhere else other than straight you have to wheel before which eats some movement based on the unit width"
if you think of the "inchlines" as determining where a unit can move to, then you're right - you must count the wheel move in the maximum movement allowance, and this will be different depending on the unit's frontage, and thus the inchlines are useless. however, if you think of the inchlines as determining "which other unit is at which distance from your unit", then they work perfectly. in this "static" use of inchlines, you just toggle them on to check whehter some effects can be applied. this is very very common in a variety of tabletopwargames: is this unit within 12" from the general so they can use his leadership? have i moved close enough so my mage can cast this 18" spell on that enemy unit? does my warmachine need to take a panic test because my archer unit was just destroyed within 6" from the warmachine? are my archers already in the 24" firing range or do i need to move them up a bit? 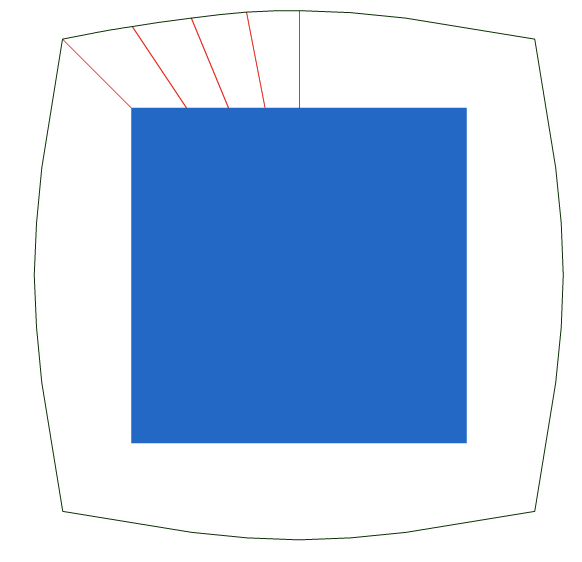 that's why the arcs makes sense for me: if my general is sitting on a phoenix (see one of my previous posts), the units at 12" from my general will be either within 12" from the front/side/rear of the phoenix base (blue lines in the picture), or within an arc with 12" radius from any of the corners (red arcs in the picture). So if I am understanding correctly this will be used to get the distance between 2 units regardless of what they are facing? Although you said that only the front fan is enough? Also is the distance between the bases or between the models? For example in AoS the distance between 2 models is based on the actual model and not the base. Also if you are using a round base or no base at all should the line curvature be different? 1) "So if I am understanding correctly this will be used to get the distance between 2 units regardless of what they are facing?" yes! this is one very clear way to put it. 2) "Although you said that only the front fan is enough?" 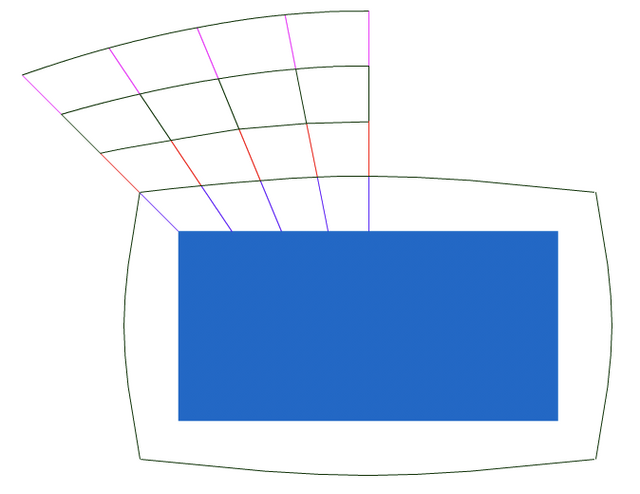 - front inchlines: none / front fan every 6" / front fan every 1"
- all-round inchlines: none / concentric every 6" / concentric every 1"
this way, if you want to have the complete information (360° fans with 1" spacing and lines of sight for front, rear and flanks) you click the sightline twice (so all four sides), and the allround inchlines twice (so every 1"). if you only want to see if your 30" range archers can shoot a target, you simply click the front inchline once (so every 6"). this "three cycling buttons" configuration would be very easy to use and very readable, but i guess it is a bit more complicated to develop, hence the suggestion on focussing on the front fan only in this first phase. 3) "Also is the distance between the bases or between the models? For example in AoS the distance between 2 models is based on the actual model and not the base." in my opinion, the distance should be between the bases. i only know of AoS as a system that uses actual models. AoS also uses true line of sight, and in a computer game i don't think you can easily implement real (3D) line of sight. so i suggest that (at least for the moment) we stick to bases. this is also because all the other systems i know (T9A in primis) use bases for measurements, and abstract line of sight. 4) "Also if you are using a round base or no base at all should the line curvature be different?" if you are using a round base it's even better - you just draw concentric circles at the distance you need! since you have a base with no lines and no corners, you don't need to combine inchlines with inchcurves, but simply to draw concentric circles around the base. if you have no base at all, i'd use concentric circles from the centre of the model or symbol. imagine you place a flag (with no base) to indicate the spot on the ground which counts as a secondary objective and which grants you extra points at the end of the game if you have a unit within 6" from it. if you want to know whether you're in range of the secondary objective, you just select it and click the 6" allround inchline button. no meters, no positioning, no discussions, no leaving meters on the field and making it messy, no waste of time removing meters because you don't like a messy field, oh yeah. if you want me to further illustrate any of these points you just have to ask! Does anyone know the exact equation? I am having some issues finding it. nonononono, it's simpler than that! 3) the red calculation lines. each of these is 1" long; they are drawn perpendicularly to the unit's borders, except for the corners of the unit. for each of the four unit corners, these 1" calculation lines are used to create a 90° arc. they are only meant to show the reasoning between the calculation of the blue inchline, and of course should not be displayed in the game. this is the reasoning behind the inchlines drawn for my previous example with the phoenix, which i replicate here above. and this is exactly what many of us need for game purposes - not the proper equal distance from a square/rectangle you mentioned in your post, but a line going through all the points which are at least 1" away from the perimeter of the square/rectangle. i know that my geometrical definition isn't that intuitive, but the figure should clear it up. long story short: every point of the inchline is at exactly 1" from one and only one point of the unit's perimeter, without being closer than 1" to any point of the unit's perimeter. so you just draw inchlines parallel to the unit's sides and as long as the unit's sides (the blue lines in the phoenix example), and then fill in the gaps with 90° arcs (the red arcs in the phoenix example). Lol, ok I think it's clear now let me give it a try, thank you for being so detailed with your examples, it really helps. Give it a try and let me know if this is ok and I'll add it to also Web, Android and iOS. my man, this is truly BEAUTIFUL! thank you! excellent excellent job. i also very much like the look of it. it also seems to work well with map textures other than grass (even pesky desert). before you implement it for the other systems, i could make two comments - but keep in mind i'm already very happy as it is! i only mention these possibilities because i think that UB should and can be the absolute best gaming platform out there, so why not push it to gold standard? 2) ADD FLANK LINES AND 6" CIRCLES: right now, you press a button and have a 1"-resolution inchline fan within the two lines of sight. i suggest you press another button and have 6"-resolution quasi-circles around the base with all four facing lines. you'd only draw circles at 6", 12", 18", 24", 30", 36", and maybe 48" and 60". combining these two visualisations (fine-grained on the front only, which you already implemented + coarse-grained on all four sides, which i suggest here) would cover practically ALL of the game situations i can imagine. in any case, the next bottle we'll kill will be in your honour!